The Cessnock District VRA Rescue Squad is affiliated with the NSW Volunteer Rescue Association and is accredited by the State Rescue Board (SRB) as the primary response rescue unit for the vast majority of the Cessnock Local Government Area (LGA). *For further information regarding squad roles and coverage area click here. Unlike all other emergency services in NSW the VRA units throughout the state are not fully government funded and are therefore required to raise the vast majority of funds needed to maintain operations. Throughout the Cessnock District VRA Rescue Squad’s history its members have spent thousands of voluntary hours conducting a wide variety of fundraising activities such as raffles, chocolate wheels, sausage sizzles, auction nights, car parking and many others. A rather novel fundraising idea carried out by members many years ago was to carry a “stokes litter” (rescue stretcher) loaded with a heavy mannequin from the Cessnock Base to the Kurri Kurri Base, a mere 15 kilomteres. The costs associated with keeping the squad operational include personal protective clothing and equipment, repair and replacement of rescue equipment and vehicles, utilities and other administrative costs and continue to increase with each passing year. The commitment to fundraising accounts for a large percentage of a member’s time within the squad. The NRMA is the NSW VRA’s major corporate sponsor and provides various contributions such as reduced insurance premiums for squad’s, supplying items of equipment to squad’s and annual funding to the NSW VRA that is then dispersed to the squads throughout NSW. The Cessnock District VRA Rescue Squad has several sources of funding which include Business Sponsorship, public and business donations, donations for service (eg – carparking) and grants. 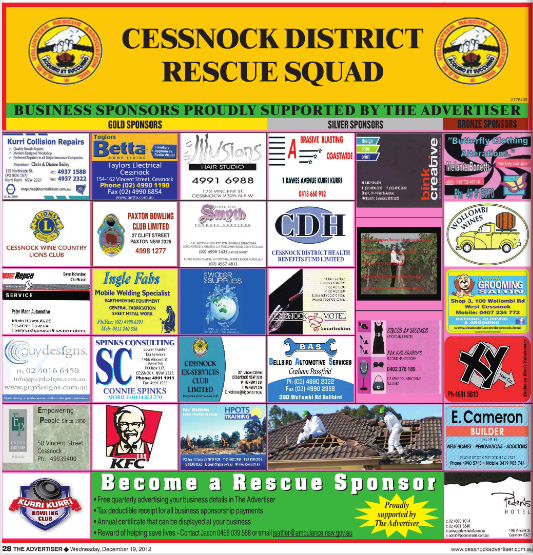 The Business Sponsorship scheme was established in 2010 to allow the Cessnock District VRA Rescue Squad to reward local businesses for their support. In essence the scheme involves businesses providing ongoing sponsorship of the squad with the reward of ongoing advertisement of their businesses details. It is a wonderful innervation that provides mutual benefit for both local businesses and the Rescue Squad. For more information regarding the Business Sponsorship scheme please click here or contact us. Throughout the squad’s history it has enjoyed outstanding support from local businesses and residents in the form of donations. All donations are greatly appreciated with a tax deductible receipt forwarded for any donation over $2. Donations to the Cessnock District VRA Rescue Squad can be made by cheque or funds transfer. Cheque payments should be made payable to Cessnock District Rescue Squad Inc and posted to PO BOX 312 Cessnock NSW 2325 with an attached letter stating your name and postal address along with reason for donation if for a specific purpose. Funds transfers – Contact us for details on how to complete a funds transfer. The Cessnock District VRA Rescue Squad members carry out car parking and other duties at various events throughout the Cessnock LGA and are paid a donation for this service. The squad may be contacted for use at such events via email cnckvra@bigpond.com.au however availability is determined by operational requirement and existing level of other squad commitments. The Cessnock District VRA Rescue Squad seeks funding throughout the year via grants from various organisations such as the NSW VRA, NSW Government and other business entities.